Over at Blog in Dm, the author has been detailing curious stories of bizarre over-reaching by some charedi rabbis in Brooklyn. The most intriguing one was a ban on listening to an Orthodox entertainer, Lipa Schmeltzer, right before a major gig. It doesn't seem to have worked, and the new Lipa LP, "A simple guy" (a poshuter yid) is now out. More details from the source: This Review Is Banned! -- Lipa Schmeltzer's "A Poshiter Yid". By me, this is good, current dance music set to frum words. Neither is something that I have a great interest in, although I'm getting ready to pick up my own copy of the CD to weigh in on the controversy. What keeps coming up for me, and I'm sure I've mentioned this before, is what the rebbes in Babylon must have said when those modern piyyutim folks started bringing in these pietistic poems set to the current dance music of the day some 1500 years ago (stay tuned--I attended a piyyut class in Jerusalem while I was in Israel this spring and it was damn fun--blog post to follow, I hope, before time erases it from my memory). So, today, at a time when I run around talking about how Judaism is changing and Rabbinic Judaism is sooo last century, people still living in the middle of that allegedly outdated community are listening to what's happening around them and setting pieties to today's modern dance music. The more things change, the more they stay the same. Irony on me if the big changes that stick have to do with music (especially when you consider that I quite like most traditional musics and have no interest in the current stuff), not מנהג or הלכה. heh! And the anti-Lipa rabbonim? The dustbin of history will be theirs soon enough. Too damn bad they have to engage in such nasty lashon ha-ra on the way. More on Heeb's allegedly Jewish "Diamond Days"
I wasn't the only person at a nonplus when looking at Heeb's "Diamond Days" event coming up this summer. Teruah - Jewish Music had even more questions than I had, and actually followed up with the Heeb folks, confirming what I have suspected for a while--Heeb is for posers--people who like Jewish ephemera, but don't really want to get too … Jewy or anything. Feh. My knowledge of rap and hip-hop is extraordinarily limited. Many years ago there were some awful shtick bands replicating every possible to-be-forgotten bad Jewish stereotype using rap. Then we crossed some barrier and it seemed to be part of the vocabulary of Jewish music-makers. We not only got Jewish rappers in the mainstream media, but groups like the Hip-Hop Hoodíos, and Matisyahu, and SoCalled started doing something that sounded like the rap I hear elsewhere, but it had this Jewish content infusion. One of the most fascinating, so far, is a black kid, a convert to chasidism named Y-Love, who has been appearing all over the country, and who seems to have gotten the attention of anyone who pays attention to rap. Now a CD is out and I can hear why. Check it out yourselves, This is Babylon. Finally, what Keith calls "neo-klezmer," Toronto's klez-jazz fusion band, Klezfactor releases its second smash album, Klezmachine. Enjoy! And many thanks to Keith. New releases at UK's "Jewish Music"
As long as I'm directing folks to this country's Hatikvah Music, I should also mention some excellent and intriguing new releases across the pond from Jewish Music Distribution. These start off with Moshe Berlin's great new release from Israel, "Melodies from Jerusalem, The Musical Tradition of the Spanish and Portuguese Jewish Communities of Amsterdam, London and New York. They also have the new Veretski Pass CD, Trafik, of course, and lots more. Check them out. Okay, these have been online for a few months—catching up means that I get to post a lot of stuff that some people will have already seen. But, this is an incredible set of reviews, covering almost everyone on my own current listening list, and on the "must review very soon or I will be depressed at not getting the word out: Michael Winograd's "Bessarabian Hop," David Buchbinder's excellent "Odessa/Havana," the hot new Veretski Pass, "Trafik," and that's just a few of the gems reviewed here. Check out The Jewish-Latin Connection, published, as usual, on the Jewish Week. This one from March 26, by George Robinson, of course. Podcast 32 captures former army trumpeter Army trumpeter Tom Powalski, as well as his "Atonement" buddy Bobby B.
Podcast 33 is with Fern Lindzon, well-known Toronto jazz pianist, also a key member of the Sisters of Sheynville and The Lithuanian Empire. Podcast 34 captures another Torontan, David Buchbinder and his wonderful new project, Odessa/Havana. Podcast 35 In this most recent podcast, Keith interviews Eve Sicular, of the ever-popular Metropolitan Klezmer and Isle of Lesbos. Excellent! 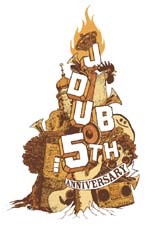 It's Krakow Jewish Culture Festival Time! Several of the concerts are being broadcast, starting with today's cantorial concert. Krakow time is GMT+1, or 6 hours later than here on the US East Coast. To catch the7pm local time concert, tune in at 1pm EST, or the equivalent for wherever you are. There will be concerts all week, most at 7pm and 10pm Krakow time. From Channe Nussbaum, Queen of Danish Klezmer, ever pushing the edges of Yiddish music, this time, in Mexico! (Is that the largest bass balalaika you've ever seen, or what? Klezmofobia has recently returned—all high from playing stadium concert in Mexico City for at least 15.000 wild young mexicans. We were also invited to perform in the mexican TV show "Animal Nocturno"; a channel wich is broadcasted in all Mexico, Latin America and the USA. We met other bands from many countries who also participated the Ollinkan Festival, and we had a marvellous time partying and jamming with people from Africa, Portugal, Spain, France, England, Germany, South America etc. Shemspeed is throwing the biggest summer party possible with Summer Stage in Central Park for FREE. The line up includes the world famous MOSH BEN ARI, with Rupa, Y-Love and Diwon. Get to the park early, as the line tends to get crazy as the day goes on. Show starts at 3pm SHARP! GET THERE EARLY TO BEAT THE LINES! 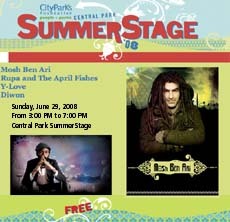 Location: Central Park Summer Stage is located at Rumsey Playfield in Central Park. Enter the park at 69th Street and 5th Avenue on the east side or at 72nd Street and Central Park West on the west side. Chana Pollack recently sent a link to the "first yiddish web-video we made here at the Forverts." It's neat! But when I suggested that it was time to move beyond the nostalgia stuff and do some hard-hitting video news in Yiddish, she responded, "Sandler's already got me cranking on the video magazine. We're on it—it's in the works. And someone in the land of Klez calling us nostalgia freaks? Ahem. Unless you're Wolfe Krakowsky--you're swimming in the stuff." Suppose Mickey Katz were alive today. Not alive in tribute. Not alive as a mere incredible clarinet player, but suppose someone could play like Mickey Katz, someone who got how Mickey would sound today and made his music sound like today's hip R&B. Then suppose that this person could convey the craziness of Katz, even better, could channel the earlier craziness of Slim Gaillard, Cab Calloway, the Barton Brothers, even add to it…. It would take someone like, say, Paul Shapiro, him of the Midnight Minyan, yes it would. And here he is with his Ribs and Brisket Revue doing just that. Ahhh, life is good. This is a take on "Essen" that feels 2008 (which is pretty hip, considering that there isn't anything happening in the Catskills these days that involves Yiddish unless you're considering the Limud folks, and that is a very different hipness). Here's the thing. This is a meta mashup of an album. As Shapiro says in the liner notes, there was a whole mash-up as folks like Gaillard and Calloway incorporated yiddishisms into their songs, just as Jews were getting into jazz. So, now the music getts mashed up again and makes you wanna get your brisket out and start dancing and singing and hollering and moving all around the room. Brian Mitchell is a monster on the piano. Listen to Cilla Owens krecht that Yiddish on Sophie Tucker's "Mama goes where papa goes" and kvell along with me. [Fair disclosure: My day job just released a movie about six groundbreaking women comedians, Making Trouble. It includes Sophie Tucker, of course. We're real proud of it. Make sure it comes to a festival near you.]. Shapiro is an absolute madman on sax and clarinet. Babi Floyd is another Barton Brother. Who knew? Such "Tzouris!" Booker King (bass) and Tony Lewis (drums) are the perfect rhythm section. KlezFest London August 10 - 15 Directed by Frank London, with SongFest directed by Shura Lipovsky and DanceFest by Andreas Schmitges. With special guests Moshe Berlin (Israel), Steve Weintraub (USA) and Joanne Borts (USA). An incredible week of Klezmer classes, workshops, masterclasses, jams and concerts in the heart of London. See www.jmi.org.uk for full details. 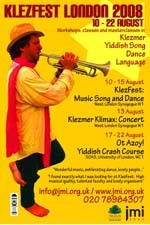 KlezKanada 2008 will take place from August 18 through 24. We have a world-class faculty and a fantastic program of concerts, lectures, films and hands-on workshops scheduled. The proprietor of this website will be there once again facilitating the Yiddish gossip column, the blog, and other neat, new ventures. 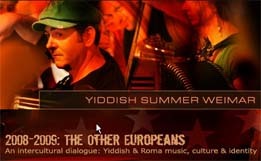 You can download all of the information at www.klezkanada.com. "[Filmed last night [back on May 18, 2008—the KlezmerShack can be slow. ari]. Yes, it's pretty dark, but the tune is all the brighter!] [You can also see Guy Schalom dance for three seconds.]" Mark Rubin takes some time out to write about an essential (and ubiquitous) member of the Klezmer Community, Pete Sokolow. Follow the discussion and you'll get video, Wex, and more. Pioneer in the "folky" new nusakh movement, Cantor Jeff Klepper, now has a blog up at jeffklepper.blogspot.com". 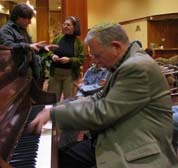 He describes it as: "devoted to 'musings on Jewish music, spirituality and humor, and wistful memories of days gone by.' There's a lot of interesting and off-beat music to listen to—what more can I say? " A quick note from Tim Sparks (see my recent concert review) a couple of months provided this important link for those who have noticed that something of distinct klezmer interest is happening along the Seine. Indeed, I have never had as many concerts from Paris, or from France, overall, on the Klezmer Calendar. Tim is back in the recording studio. Expect something new from him, via Tzadik Records, very soon. On my myspace page, www.myspace.com/picksparks, in the favorite friends section, I've posted some of my favorite groups in the Paris New Klezmer/Gypsy scene: Le Freylekh Trio, Caravanne Passe, Finzi Mosaique, Untchak Attak, TsimTsoum, DJ Tagada and Gettabang. If you're not already familiar with them, I think you would enjoy checking these out. It was just a few years ago that Mark Rubin sent me word of an exciting project. He and his Austin-based band had screened the 1920 silent film by Paul Wegener, The Golem to a (mostly klezmer, with some davening assists by Cantor Neil Blumofe) soundtrack he composed. The results were captured on DVD. The result is fascinating. In the 16th century Prague, of course, wild Jewish wedding music would surely have been popular as 20th century German Jews would have distanced themselves as far as possible from such unmannered music. Anachronisms abound upon anachronisms (including some of the very romantic plot twists), all moved along at an enlivening pace by Rubinchik's Yiddish Ensemble. Occasionally, one can hear the reactions of the audience viewing the movie. This classic was almost immediately sold out. I am pleased to announce that "The Golem: How He Came Into The World" is once again available to the discerning public, with the klezmer accompaniment from www.filmbaby.com as DVD or digital download. YUGNTRUF presents our year's week-long retreat, where we strive to speak only Yiddish, will be held WEDNESDAY, AUGUST 20 through TUESDAY, AUGUST 26, 2008 at the Berkshire Hills Emanuel Adult Vacation Center in Copake, New York. The Yiddish-Vokh is a real community, in which our members give the lectures, lead discussions and workshops. Our members include professors, activists, writers and musicians, who share their knowledge, talent and love of mame-loshn. There's a swimming pool and a beautiful lake. All activities are in Yiddish, including sports, folk-dancing, lectures, discussions, literary reading, campfire singing, talent show, concerts, films, Yiddish classes for advanced beginners and organized programs for children. The food is kosher, with vegetarian options. On Shabes, services will be available. There is very sad news from Manchester, UK. Our friend, violinist Michael Kahan was killed last Sunday. List members from the UK, plus anyone who has attended KlezFest London will remember Michael as a wonderful musician and a dear, dear soul. It is with great sadness that we at the Jewish Music Institute relate the tragic and untimely death of one of our klezmer family in the North, Michael Kahan. KlezFesters will remember Manchester based, Michael and his sensitive violin playing—particularly with Ros Hawley in a well known and esteemed duo called Klezmer Gourmets. Michael was inexplicably stabbed to death near his home on Sunday. He had popped out in the morning for some breakfast bagels for his wife and son, and some guy got out of a car and stabbed him to death. Friend and colleague, Adrian Dobson says: 'It just doesn't seem real. Such a waste! His life together with Eva (whom he married only last summer) was just beginning to take off. They gave each other so much and had so many plans together. The wonderful thing was that he had just begun seeing his teenage son again after so much time apart, and there was definitely a dream of being part of a family again'. Adrian adds: We are all in a state of shock here at Michael's tragic death. Nothing can prepare us to cope with such random and extreme violence, and absolutely nothing can explain or excuse it. I fear that we are only beginning to appreciate the extent of our loss as the tragedy continues to unfold. Many of us musicians were inspired by Michael who was so generous with his talents, and we all valued his warmth, enthusiasm and creativity. I will miss him as a very kind and good friend, and I will remember him in my playing of klezmer for as long as I live. Klezmorim in London and Manchester played in tribute to Michael on Sunday, Jun 8—see below. Ilana Cravitz, the London-based klezmer violinist and workshop and jam organiser says' He was a very gifted fiddler and a stalwart of the Manchester klezmer community, running regular workshops and other sessions. He had also been an enthusiastic participant at KlezFest, and this year taught some Tuesday classes at SOAS in London for the JMI. His death is a really tragic loss'. As a tribute to Michael, Ros and her husband Fish have invited his musician friends to play with them in the park. She envisages 'The slots will be like a jam session for Mike, where we play together tunes he enjoyed. He loved dancing too and was recently taking on leading dancing at events'. Adrian Dobson says: I am so glad that Ros has given us the chance to meet this weekend to play klezmer together and dance in Platt Fields Park. It feels absolutely right that we remember Michael with the music and dance that he loved. We won't ever be able to fill the space that he has left, but we will be able form a circle of hugs with all our memories of Michael in the centre. Ruth Steinberg from Leeds writes: Michael was at the last Klezfest London and I remember sitting in a restaurant round the corner from the Shul talking with Geraldine and her team with a few of us about 'Klezmer up North' and exploring how we could build. It was at the JMI Liverpool Wind Band event with Frank London event that I last saw him and can only think of him as a lifeful and life affirming musician and a kind and gentle Jewish man'. Ros and friends have set up an email address for anyone wishing to leave any messages and thoughts—Steve Landin has put this on the Klezmer Gourmets website too. 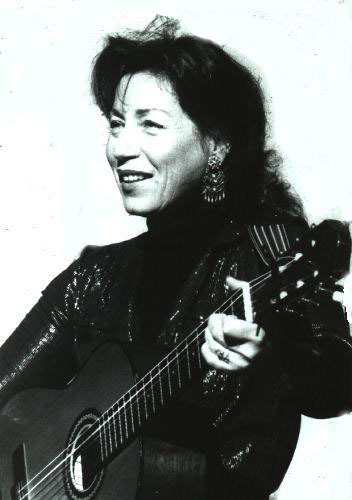 Ros says: The Klezmer Gourmets website is going to become a place where musicians can leave their thoughts so that there is a collective focused space for people to remember together, Eva wants this too, so please keep an eye on this and leave something there, and let your Klezmer networks know the same. Life up here is so strange—we were meant to be rehearsing today for a number gigs we had coming up—it was meant to be a time of looking forward to the summer and the gigs this brings and enjoying playing. Hopefully we are helping Eva and the family by giving people a focus to help them come to terms with the shock of what's happened and her some kind of space to be with her family'. Laoise Davidson, who with Yvonne Glass, and Barbara Rosenberg is running KlezFest London this year says: "Not only was Michael a gifted violinist and teacher who was passionate about Klezmer music and Jewish culture, but he was also a very happy guy who always had a smile on his face. He will be terribly missed." The klezmer London team, as well as the entire faculty of KlezFest—who will all pay tribute to Mike at this year's KlezFest (10–15 August)—join me in sending the traditional Jewish greeting of wishing you all a long life. The thoughts and wishes of all of us are with Eva, and Mike's and Eva's families. We wish them the health and strength to come through this sad time. The wife of a man stabbed to death as he went to buy bagels for breakfast has paid tribute to her "kind, gentle and gifted" husband. Violinist Michael Kahan, 39, died after being stabbed twice in Crumpsall, Manchester. It is thought his attacker had mental health problems. The Jewish man was found outside Johnstone's Leyland Decorating Centre in Middleton Road, near his home. A 31-year-old man held on suspicion of murder remains in police custody. His wife Eva said: "Michael was a very kind, gentle and gifted man—he was just going to buy Sunday breakfast but he never came home. "He had a great sense of humour, was very chatty and instantly likeable. "He was simply a nice guy and we are devastated at what has happened. We just want to be left to grieve in peace." Mr Kahan trained at the Royal Northern College of Music and was an expert in a type of Jewish music known as klezmer. He was in a band called the Klezmer Gourmets. A post-mortem examination revealed he was fatally stabbed once in the abdomen and once in the chest. A 48-year-old man who was arrested on suspicion of murder has been released on police bail pending further inquiries. A violinist stabbed to death near his home in broad daylight was allegedly killed by a man who had recently been discharged from a mental hospital, it emerged today. Michael Kahan, 39, had gone to buy bagels for Sunday breakfast for himself and his wife at the weekend when he was attacked. Neighbours of the man accused of murdering the father-of-three said he had recently been treated in hospital for schizophrenia, and an investigation has been launched into his care. Heeb's "Diamond Days" - this is Jewish? As I got through months of accumulated email messages, some of them actually relevant and worth posting, my breath was taken away, once again, by a music fest hosted by "Heeb" magazine, the publication for people who want to feel "Jewy," but don't want to be contaminated by anything Jewish. So, it will come as no surprise that Heeb has a new music festival coming up in July called "Diamond Days" that features nothing recognizably Jewish in the lineup. I would be the last to suggest a token klezmer band. I'd be satisfied even with one of the sterile nouveau religious bands featured in Moment Magazine's "Jewish Music sampler" of a few years ago, or some hip hope like SoCalled or Matisyahu or Y-Love. Perhaps something less classifiable like Pharaoh's Daughter, or Sephardic music of some form--Divahn, say. There are hundreds of people making music that draws on Jewish text or culture in some way. It would be kind of neat if an event targeted at Jews that involves 30 acts found room for some of that. Or would that get in the way of the desire to hang with people who may be genetically Jewish (I find it as unlikely that a Jew by choice would find this event any more of interest than those of us who are Jews by tradition) without getting too … Jewy? I like Heeb's attitude, in theory. I don't find the magazine particularly readable or interesting, and I gotta say, I am even less interested when so much efforts goes into something so irrelevant. And I guess that's as much thought as I can give it. On to updating the calendar and maybe getting some Jewishly relevant content back on the blog. ... It was an incredible meeting of hearts, souls, minds, and music. Marin and Adam are extraordinary musicians, and they introduced me to a whole scene of musicians in Chisinau playing many of our familiar melodies at the speed of light, or possibly faster. It astonished all of us to discover that these Moldavian musicians had never heard of the klezmer revival, and they had never heard the old klezmer recordings from the 1910s and 1920s that are so important to our understanding of Yiddish music. When I played them Naftule Brandwein, Dave Tarras, Abe Schwartz, Belf's Orchestra, and so on, it was like a generation from 90 years walked into the room for the first time for them. In the days that followed, our conversations and exchanges of ideas, melodies, styles, memories just grew deeper and deeper. So what I want to say to all of you is this: I think that Yiddish Summer in 2008 is going to be just incredible, a great challenge to our ears, fingers, hearts, and understanding in many ways. The technical level will be high, definitely, and the more experience one has with klezmer music, the better. I wish I could go to every music school, conservatory, and university in Europe and tell the students what they'll experience if they come to Weimar this summer. Since I can't do that, I want to ask all of you to think of your friends, acquaintances, and contacts to music schools, cultural centres, universities, etc. If you can help spread the word about Yiddish Summer, please send Stephanie an email and tell her and she'll send you some flyers to distribute. I also want to encourage you to come to the symposium from July 12-14, just before the beginning of the Instrumental Workshop. It will be a very rich discussion of topics ranging from comparing Roma and Yiddish culture and history to clichés and stereotypes, legal and human rights, and of course research in Yiddish and Roma music. Speakers are coming from Poland, Moldova, Germany, Italy, Ukraine, Switzerland and the USA, and it's going to be a very international group indeed. At night we'll have a mini-film festival outdoors, showing “Gadjo Dilo”, “Auf der Kippe”, the music films of Yale Strom, and Adela Peeva's great film "Whose Is This Song?" For more information, please see our website. Thanks for your attention, and hoping to see you this summer!